What a unique idea! I was contacted to capture the events of a wedding ceremony when Jessica and Matt were getting married. I didn’t know either one of them, and they were coming in from out of state. Jessica sent pictures of the happy couple, pictures of her beautiful dress and shoes, pictures of the wedding masquerade mask she would be sporting in lieu of a veil, and a few other activities that would be part of the ceremony. It was a very unique wedding! 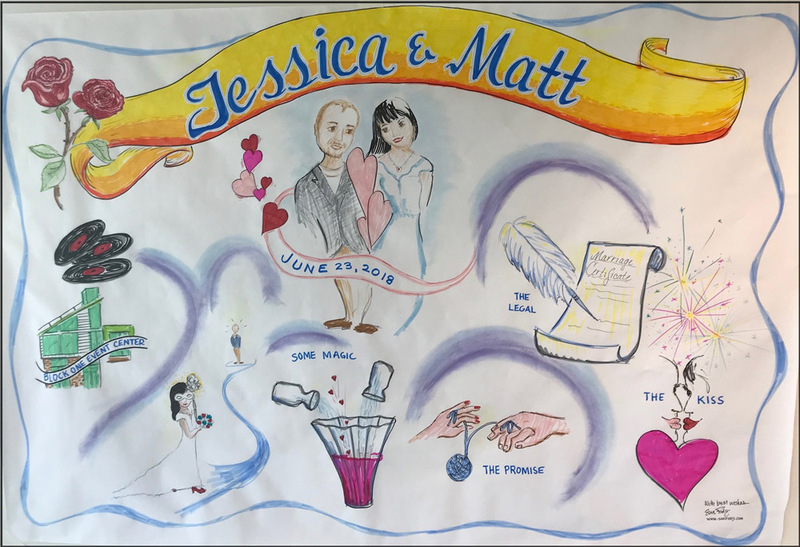 On the big day, I set up at the front of the room and began drawing as the guests arrived. I recognized the groom right away – that’s what happens when you study pictures of people. So much more handsome in real life. Drawing as people gather sparks interest and curiosity about what will occur. Generations of family and friends arrived. The big event began. The bride walked to meet her groom. They poured clear liquid together that blended into pink. Magic! There were no rings, but a promise made by tying blue ribbon – the site of future ‘ring tattoos’. The blue ribbon is also reflected in the soft blue border of the whole picture…tying everything together. Then of course there was the traditional signing and kissing. They now have a memorable picture of a momentous part of their special day. How cool would it be to capture your wedding, retirement or anniversary party, or an important birthday event? We graphic record to capture what people say and do in the form of images that are memorable. What’s your next event? Graphic recording will help make it unique! Contact me today.